To give myself a break from repotting I thought that I would look at how the 'bulbs' are still dominating parts of the garden even though their peak flowering season is past. The dactylorhizas (Cruickshank form) just go on and on, we have had to water them as we are having a very dry period, most unusual for a Scottish summer, and they were flopping over a bit. 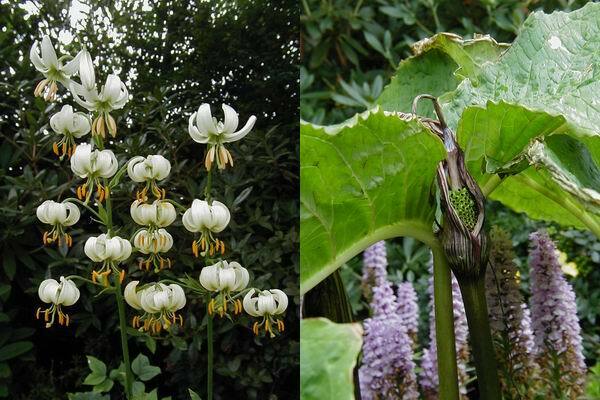 The leaves of the giant Arisaema are stately and the Lilium martagon album are just about to open. There they are open, they are best seen against a dark background which really shows them off. This Arisaema is setting seed for the first time this year. When they are young plants arisaema flowers tend to be male or female but when they are mature plants they are both and so can set fertile seed even if you have only one plant. Dactylorhiza elata also proves itself an excellent flowering hardy orchid for the garden as it is a month at least since I first pictured them for the log. 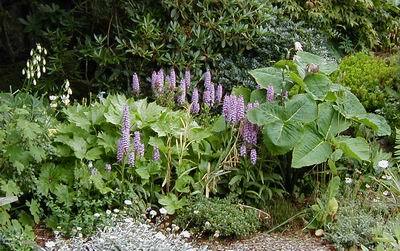 Here I show it with a group of plants that have chosen their own spots as they seed around, Meconopsis betonicifolia, Lychnis flos-jovis and the yellow Digitalis grandiflora. 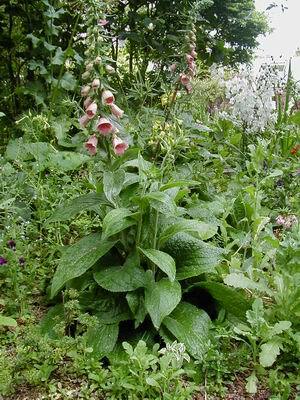 Talking of Digitalis, I was taken with a stand at the Chelsea Flower Show in 2002 which had nothing but foxgloves. I am always looking for plants that will give us summer interest in the bulb beds that will not compete too much and will enjoy similar growing conditions and these hybrid Digitalis seemed to fit the bill. This is the first year that they have flowered and we will assess how they perform with the bulbs over the next year. Back to 'bulbs' the blue clover Parochetus communis always attracts a lot of interest from visitors. 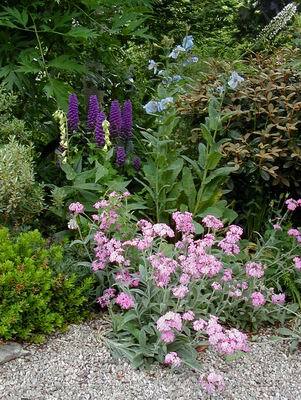 It is native to South Africa and the Himalaya this is the Himalayan form which is perfectly hardy. The S. African form is, I am informed, not hardy. 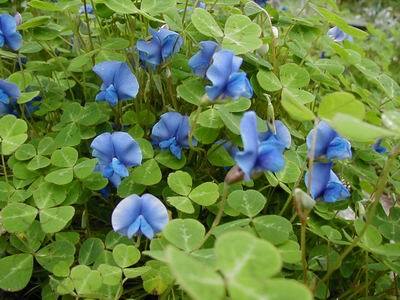 When it is happy it runs around and we grow it at the edges of a path and every summer it produces hundreds of its blue flowers over a very long period. We keep it out of the humus beds as it can run riot and damage the dwarf ericaceous plants which do not like this kind of competition. 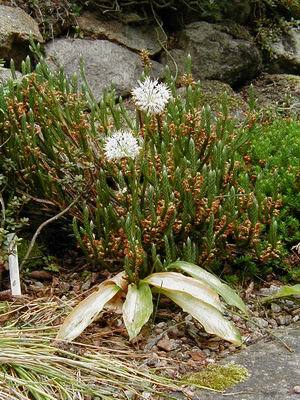 Another plant that chose its own spot is this Allium Prattii which seeded down from the bed into the gravel path where it is growing happily with Cassiope, Phyllodoce and Narcissus bulbicodium as near neighbours. The trouble with so many alliums is that by the time the flowers are out the leaves have already started to go yellow. This makes them very difficult to show as Judges do not take this into account and take points off when all the plant is doing is 'being in character'! 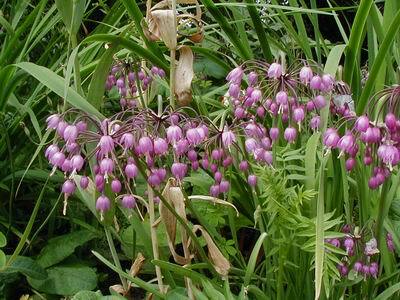 Allium macranthum is another attractive summer flowering bulb. 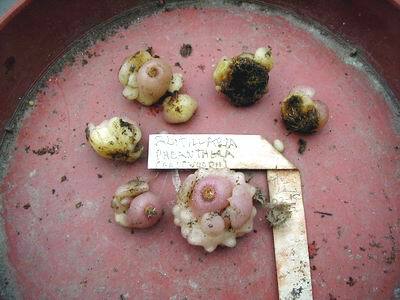 I spoke last week abut some frits not doing so well this year and you can see from these bulbs of Fritllaria phaenthera that some have rotted while others are perfectly healthy. These are all from the same pot so they had exactly the same treatment, I just think that we cannot expect all our bulbs to perform perfectly every year, they don't in the wild. Do not throw the bad ones away, scrape out the rotten bits and dust them with sulphur powder and plant them back with the others. 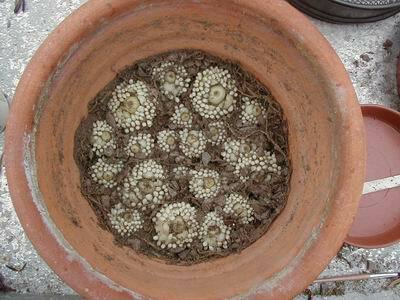 They should produce some small offsets by next year and I have never had this type of rot affect the healthy bulbs in the pot. If you are worried about the rot spreading you can also place the rotten bits in a plastic bag with some dry sand in the fridge where they will also produce offsets.